Publisher: Unknown. Most probably published in the late 1920s or early 1930s. Condition: Hardcover, no dust jacket. Very good. Slight wear to cover and foxing to edges. Small booksellers’ stamps to back endpapers. No other defects. 898pp. Very useful for research. A fascinating study. 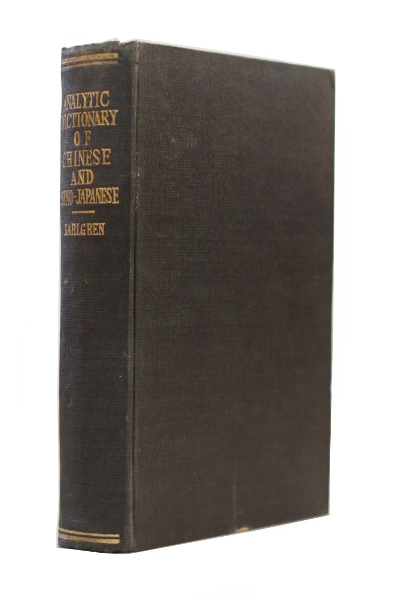 A dictionary focusing on etymology, with explanations of each character and its pronunciation in Mandarin, Ancient Chinese, Cantonese and Japanese. One of the earliest studies of Ancient Chinese in English, containing the theory that Ancient Chinese had eight tones. Klas Bernhard Johannes Karlgren (15 October 1889 – 20 October 1978) was a Swedish sinologist and linguist who pioneered the study of Chinese historical phonology using modern comparative methods. 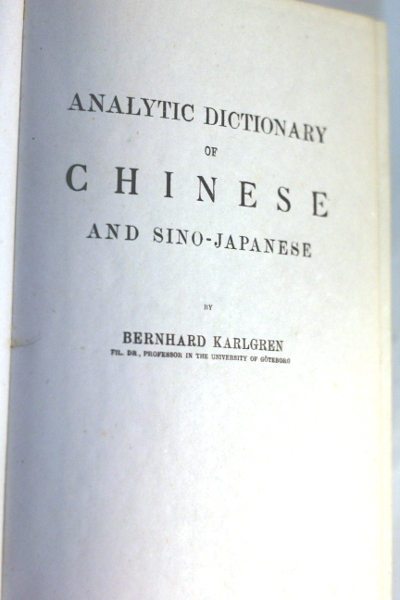 In the early 1900s, Karlgren conducted large surveys of a number of Chinese dialects and studied historical information on rhyming in ancient Chinese poetry, then used them to create the first ever complete reconstructions of what is now called Middle Chinese and Old Chinese. Karlgren was the first scholar to use European-style principles of historical linguistics to study the Chinese language. He was also the first one to reconstruct the sounds of what is now called Middle Chinese and Old Chinese (what he called “Ancient Chinese” and “Archaic Chinese” respectively). Karlgren suggested that at the very earliest stage recoverable, the personal pronouns were declined for case.